← Let it all just drop. 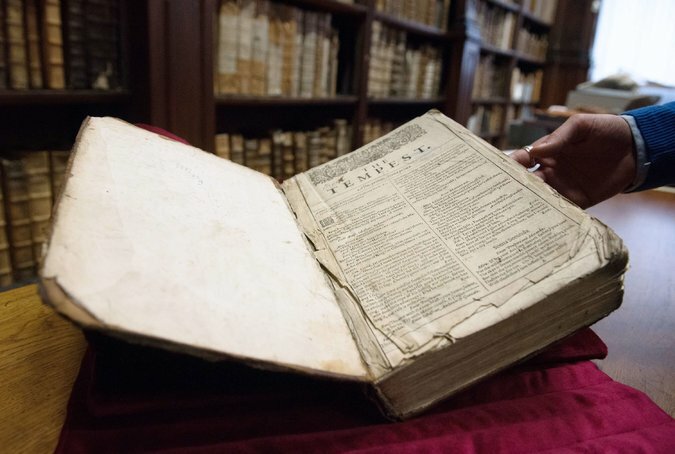 They discovered a first folio of Shakespeare in a library in France. Is this like a big deal? “This is huge,” said Eric Rasmussen, an American Shakespeare expert who traveled to France over the weekend to authenticate the volume. Mr. Rasmussen pointed out the name “Neville,” inscribed on the folio’s first surviving page — a possible indication, he said, that the book was brought to St.-Omer in the 1650s by Edward Scarisbrick, a member of a prominent English Catholic family who went by that alias and attended the Jesuit college, founded when Catholics were banned from England’s universities. The St.-Omer folio, Mr. Rasmussen said, also contains handwritten notes that may illuminate how the plays were performed in Shakespeare’s time. Like… Hamlet has a happy ending now? In one scene in “Henry IV,” the word “hostess” is changed to “host” and “wench” to “fellow” — possibly reflecting an early performance where a female character was turned into a male. “I’ve never seen this kind of gender switch in a Shakespeare folio,” Mr. Rasmussen said. Today, first folios are tracked like rare black rhinoceroses, right down to their disappearances. One is known to have burned in the Great Chicago Fire of 1871; another went down with the S.S. Arctic off Newfoundland in 1854. New ones come to light every decade or so, Mr. Rasmussen said, most recently in the library of a London woman who died without a will. “It was a mess, with a bunch of second-folio bits mixed in,” Mr. Rasmussen said. The disgust in his voice.